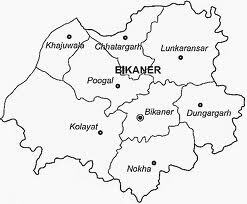 Bikaner district is a district of the state of Rajasthan in western India. The historic city of Bikaner is the district headquarters.Bikaner was founded by the Rathore prince, Rao Bikaji in the year 1488. This town is famous for its rich Rajput culture, delicious bhujias, colourful festivals, magnificent palaces, beautiful sculptures and made of sand stones.Some part of the district lies in the Thar Desert. Rajasthan Cana. also called The Indira Gandhi Canal, passes through the district from northeast to southwest, providing irrigation water for the district. Bikaner also has world famous miracle temple of Karni mata in Deshnok also known as Temple of Rats.Bikaner has 8 tehsils which are Bikaner, Kolayat, Khajuwala, Chhattargarh, Pugal, Nokha, Loonkaransar and Dungargarh. Bikaner is located in North-Western Rajasthan with Sri Ganganagar in the North, Jaisalmer and Pakistan in the West, Churu on the East and Nagaur and Jodhpur to its South-East. Bikaner district in Rajasthan enjoys extreme climate in all the seasons. The summer season is quite hot and winter season is cold with the temperature goes well above 50 C during the summers, while in the winter it goes below 0 C. The weather remains quite humid due to moderate rainfall in monsoon. Bikaner has a railway station which is connected to major Indian destinations like Jaipur, Churu, Jodhpur, Delhi, Kalka, Howrah and Bhatinda by frequent trains. tate owned as well as private buses are available to Bikaner from Delhi, Jodhpur, Agra, Ajmer, Ahmedabad, Jaipur, Jhunjhunu, Jaisalmer, Barmer, Udaipur and Kota. Jodhpur Airport is the closest domestic airbase, located around 250 km away from Bikaner.